There are certain advantages to going without Mom. The amount of stuff that we have to bring is much less. Not only don't we need Mom's personal stuff, we don't need as much dish-washing stuff. We don't need as many pots and pans or dishes or any vegetables to eat. We don't need 10 pairs of shoes for each of the boys and we don't need every coat they have ever owned along with every possible combination of outfits you could ever imagine. Also, with just the boys and me, we don't have to bring our big tent. Our medium-sized tent is so much easier to set up and take down. 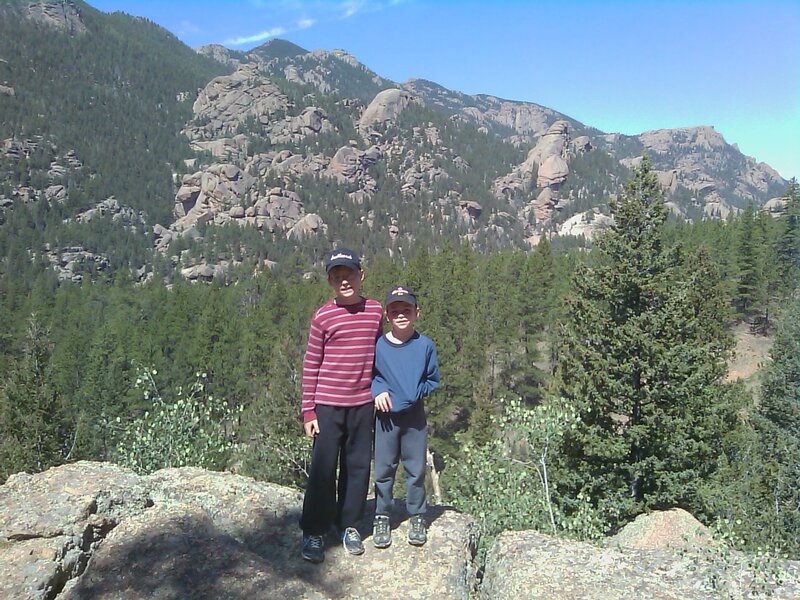 Plus, when Mom is not around, I can let the boys do more of the work. Apparently, their mother thinks it is not safe for children to actually start the fire. Pee-shaw I say. With Mom at home, I can sit and drink my beer while Tyler does that. Another huge advantage is that I don't don't have to wait for my wife to wake up to get the day started. On Saturday we had breakfast, cleaned up, drove almost an hour to our trail-head all before we would have even been able to finish breakfast had we been forced to wait for the woman to wake up. One disadvantage of not bringing along Mom, is that we are more likely to forget things that we wanted to bring. This time, I missed the camera. This is why all these pictures are crappy cell phone photos. The trail we went to is the Goose Creek Trail in the Lost Creek Wilderness. This is the same one I back-packed on for SheppyQuest 2005, 2008, and 2009. The boys have been saying that they want to start back-packing and I figured I'd show them this trail and some of the places that we might camp if we ever actually do go back-packing. The trail runs along the Goose Creek for quite awhile. 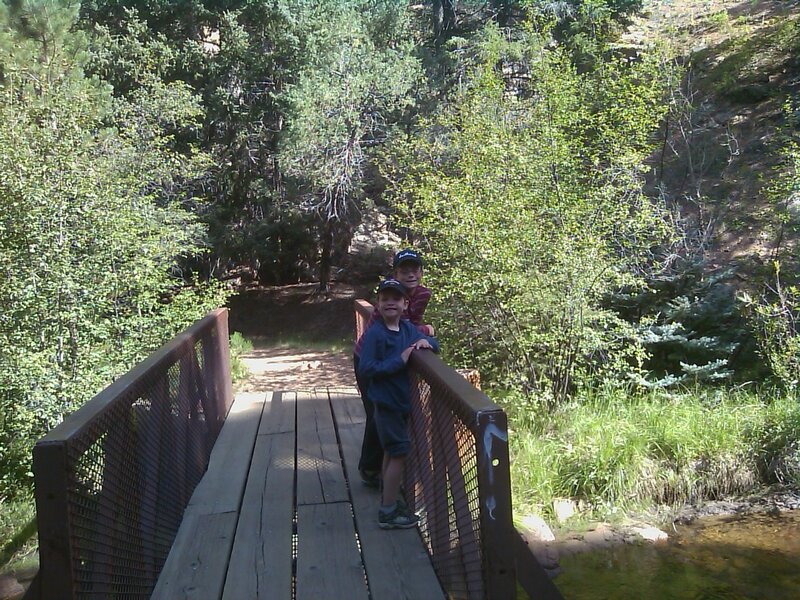 The boys (of course) spent a lot of time throwing rocks into the creek. My hope and intention was to make it to the "Lost Park Reservoir Site" that I mentioned in SheppyQuest 2005 . According to my notes of that trip, it took me about an hour and a half to get there in 2005. 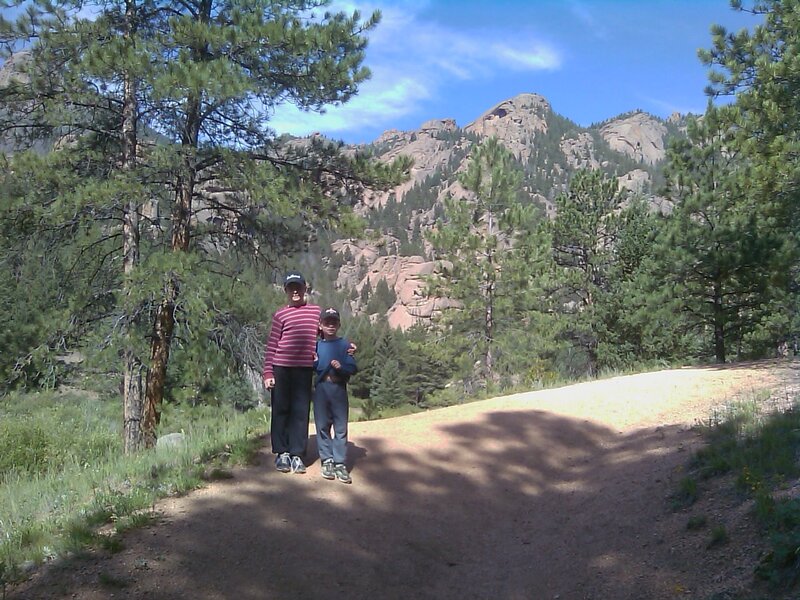 But, between trying to keep the boys going instead of throwing rocks and climbing at the beginning, and the length of the uphill portion of the hike, we decided to turn back before we made it to my goal. 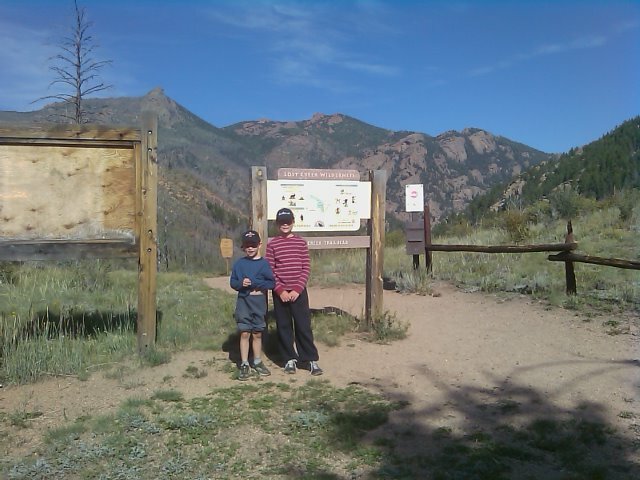 It is too bad, because I know the boys would have thought it was really cool, but it was not worth the extra whining that I would have risked had we pushed on. 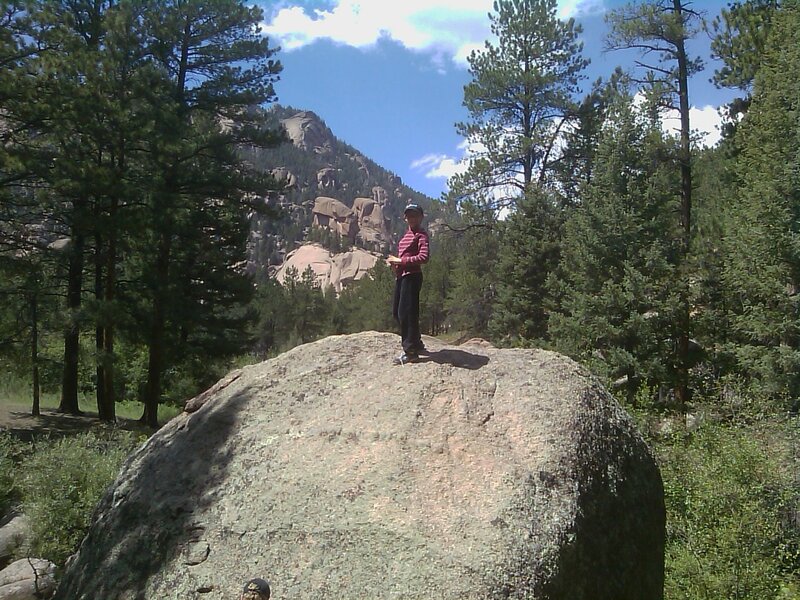 The picture to the right is on of the same rocks on which I photographed myself in 2005 (follow this link to see me on the rock). The angle is a bit different, but trust me, it is the same one. We finally had lunch about 2 hours into our hike. 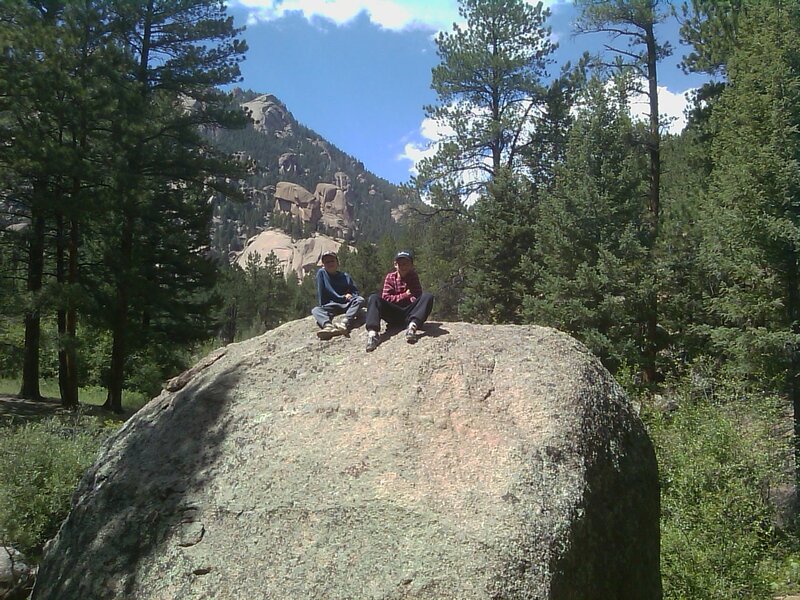 We had a few "Lunchables" on some rocks close to the cave on the left. 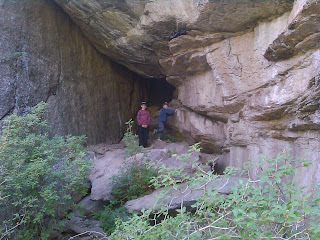 The cave was cool (both as in not warm and as in AWESOME). We probably could have gone farther in but decided that we wouldn't fair too well if we ran into a wildcat sleeping in there. It was still pretty awesome. It was about half an hour later that we decided to turn around. I think we were so close to the goal, but I had been thinking that for quite awhile. And, we were heading down (meaning we would have to come back up on the return trip) And, it was just getting close to the time we would have to turn around to make it back to camp for supper time anyway. 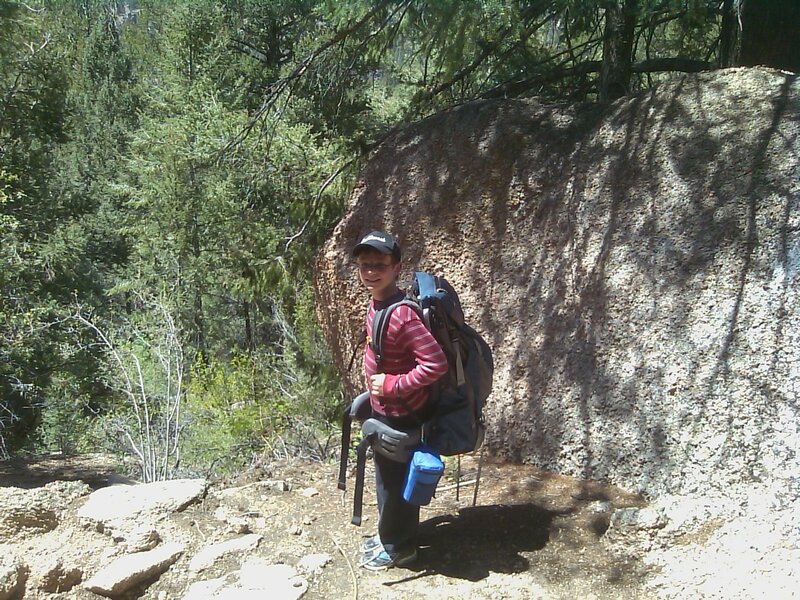 While hiking back to the trail head, Tyler was looking up at some rocks and spotted a container. 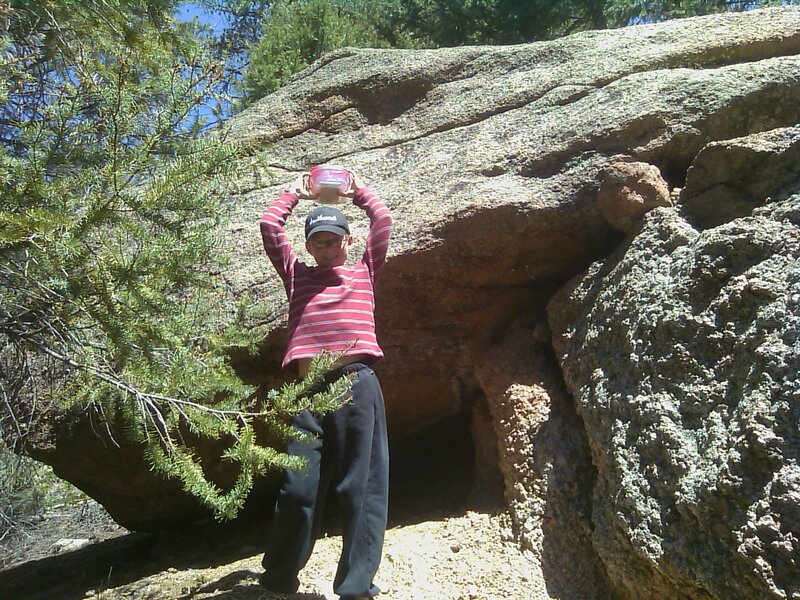 He wondered if it was a geocache. And, as it turns out, it was. I actually cannot find the cache on geocaching.com, but it really was there. Unfortunately, I didn't pay attention to its name. We did sign the log book, though, and it has not been there very long. Anyway, that was sort of cool to find a geocache just looking while hiking along. 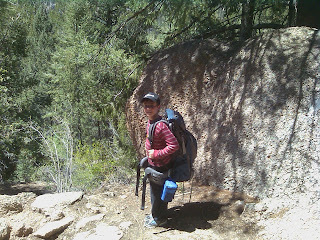 Tyler took the back-pack for awhile. It is obviously too big for him. He kept it on basically long enough for another group of hikers to see him carrying it. Then, he gave it back to me. It was sort of funny. 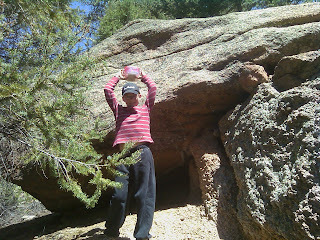 Here is one of the many rocks that the boys climbed along the trail. 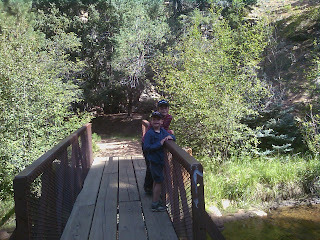 Once we got back down the to creek, I showed the boys how to use my water filter. They had never seen that before. We also took off our shoes and played in the creek a little bit. 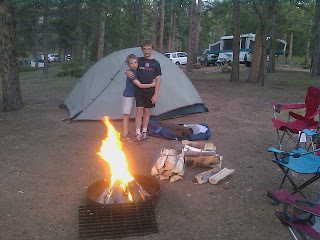 We ended up getting back to the campground around 5. We ate around 6. 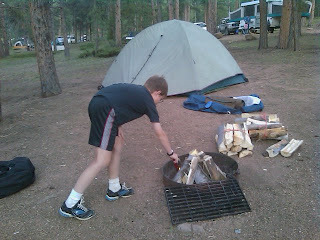 Then, we started a camp-fire. Eventually, we went to sleep. I, for one, really slept well after such a long active day. Connor didn't even want me to read book to him, so he must have been pretty tired too. Today, we made eggs and sausage, cleaned up, packed up, and headed home in plenty of time for Mommy to make us lunch. It was great fun. We will have to do another Boys' Camping Trip soon.